Elephants saying hello. All photos by Jeana Shandraw of . What's the difference between elephants and humans? 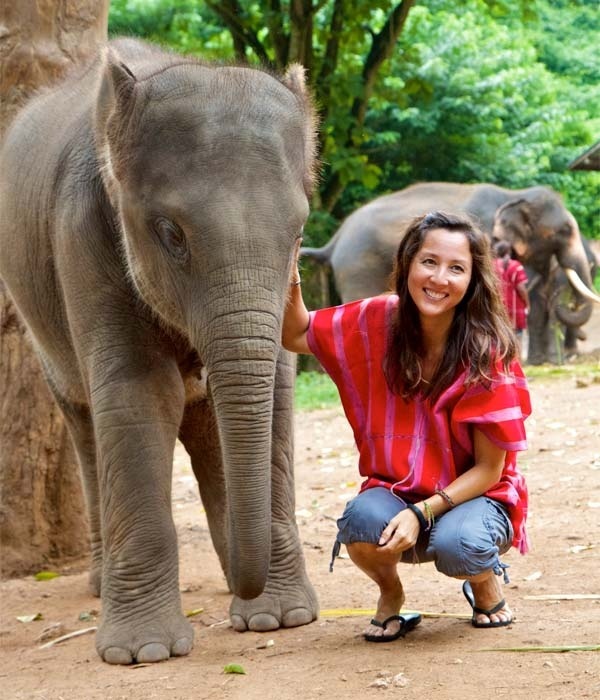 Less than you'd think, as travel bookstore owner Natalie Compagno learns at a fantastic and progressive elephant farm in Thailand. Chiang Mai, THAILAND – I am completely petrified and unable to move, but the mahout, the elephant tender, beckons me closer. I didn't realize how small I would feel or how powerful elephants are in person. I keep telling myself that they are called "gentle giants" for a reason, and I can see everyone else is completely unafraid. But for some reason, I can't move. I am a few feet from this pachyderm, and it appears I am not going to get closer. My legs just aren't working. I am at the in Chiang Mai, Northern Thailand, to spend the day caring for an elephant. So far, very little progress has been made. The beautiful creature flaps his ears, a good sign I am told. It means he is happy, and as he turns his head, I look into his eyes. It is at that moment when my feet start functioning again and I am suddenly next to this incredible soul, petting his side and smiling. It is true what they say about elephants. They are smart, playful, and have distinct personalities. And this one had just told me, with one look, that it was okay to come say hello. He broke the ice, and we are now friends. I'm in a group twelve caretakers, and we are summoned to an outdoor hut where the owner, who is appropriately named Pat, begins his lecture by reassuring us that "this will be the only boring part of the day." But he is anything but boring. 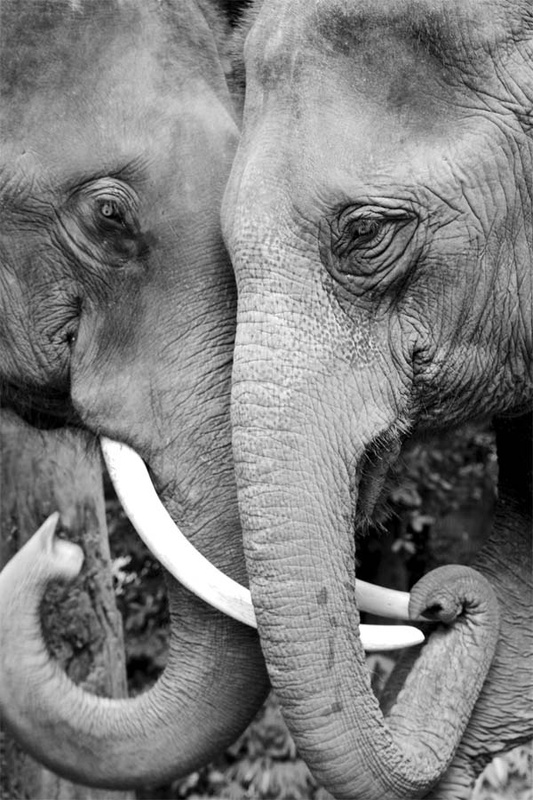 "I do not love elephants more than people, and I do not love people more than elephants," he continues. "We are the same." Patara's philosophy "Extinction is Forever" is not about guilting guests into donating money, but rather about creating a true bonding experience for everyone. Patara Elephant Farm is about connecting with the elephants and forging new relationships, treating them as you would yourself. By being an elephant owner for a day through meaningful activities, visitors can spread the word about these sacred animals. Pat's hipster vibe and constant humor make him charming and engaging. Everyone is drawn to him, and the more we hear about his life's work, the more we are moved. He talks about the other elephant sanctuaries where most of the day is spent watching videos and being lectured at about the drastic drop in species numbers. Patara doesn't take money from the government or from wealthy donors. 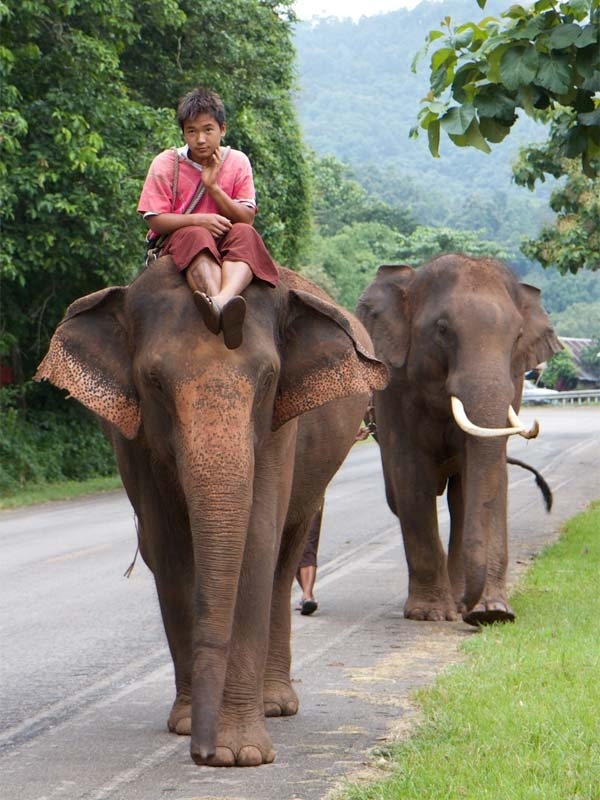 They are simply a Thai family with elephants, running a family business. The numbers speak for themselves: At 24 births and zero deaths in ten years, this is one of the most successful elephant farms. They even give the elephants a honeymoon when it's time to mate. 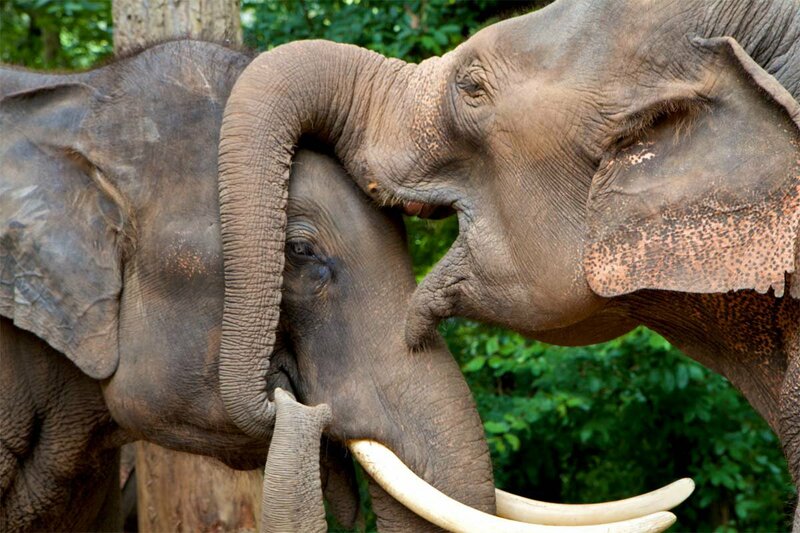 The elephants choose their own partner — very progressive, by the way — and the happy couple is sent off into the jungle for a week to get to know each other and consummate their union. Being an elephant owner for the day is serious business. This is not a typical tourist joint where visitors half-heartedly participate while the mahouts do all the work. Nor is it an excursion created for photo ops, although visitors take lots of photos and videos. This is a real education, and the reward is greater because of it. First, caretakers put on shirts in similar colors. This helps the elephants feel comfortable right away. Then it is time to meet your elephant and evaluate his well-being. Is your new friend happy? Ears flapping and tail wagging means yes. Next, we monitor the animal's health. We look at everything from toenails to tear lines to poop. 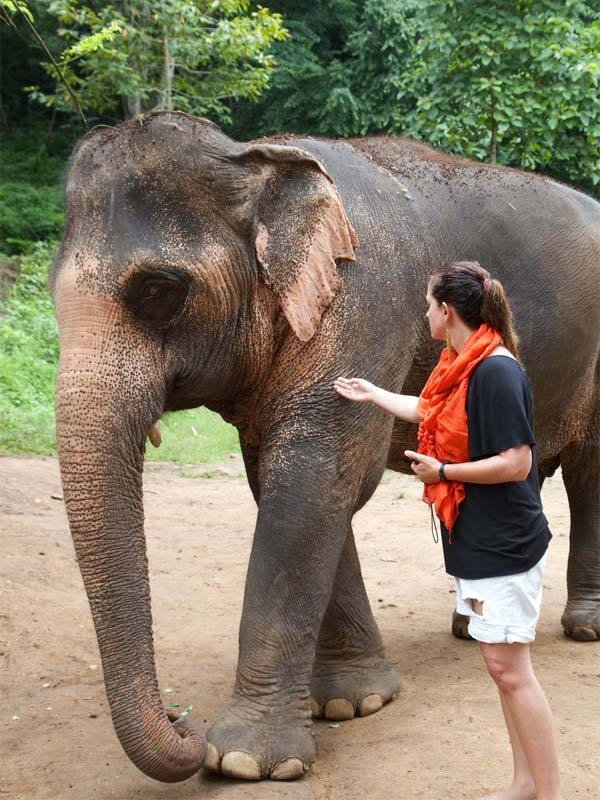 Yes, that's correct, smelling and squeezing elephant feces is part of the program. Because elephants are vegetarians, their dung is actually sweet smelling if it's healthy. It's important to check on the their health every single day. Dehydration, digestion issues or skin disease can kill very quickly. Now it's time to brush the dirt off their backs. In order to get up on top with leafy branches to do this, one of you has to adjust. Watching these unwieldy animals suddenly roll onto their sides is exciting and almost cute. The really fun part is watching the little baby elephants come running in to try to sit on their parents' sides and faces. Playtime! The adults push the little ones off, only to have the pranksters jump right back on. I remember something Pat said earlier about how elephants are like humans in that everyday they need to groom, go for a walk, eat, bathe, see their family, and play with their friends. This just doesn't happen in a natural way at a zoo. But we do all of that and more with them, and it fills me with joy to see how happy and quirky they all are. 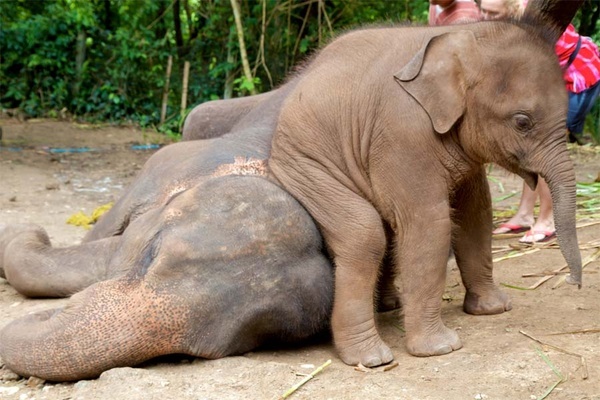 One more bounce by the baby, and her uncle comes over with his long trunk to whisk her away. After riding the elephants through the jungle to the waterfalls — a journey that proves much harder than it seems — it's time for a bath. Every part of the elephant has to be scrubbed with a brush, and certain parts of the body are to be stroked in specific ways. That means getting into the water with them and using old-fashioned elbow grease. The shrieks and laughter from everyone are contagious. One woman keeps getting tickled by her elephant and lifted out of the water. Guess who is back to her old tricks? The tiny elephant in the stream bobs around like a cork, teasing everyone. She especially loves one young mahout who earnestly tries to show a visitor how to wash properly. Nudge, shove, spray, repeat. The rest of the afternoon is spent on a tour of the back area. I get a thorough sense of how this farm operates on a 24-hours-a-day, seven-days-a-week basis. Imagine having dozens and dozens of kids, and they each weigh 8,000 pounds. Patara gives back to the community in many ways, including donating elephant dung for fertilizer to local villages. We are more impressed than ever. I leave exhausted, thrilled, and dirty. I think back to my favorite moment at the farm. Right before the bath in the waterfall, we take a rest to make sure everyone was accounted for. Two elephants start "kissing" and hugging with their trunks and the baby runs in between them, in and out, trying to get more attention. The bond between these two immense, majestic creatures is palpable. 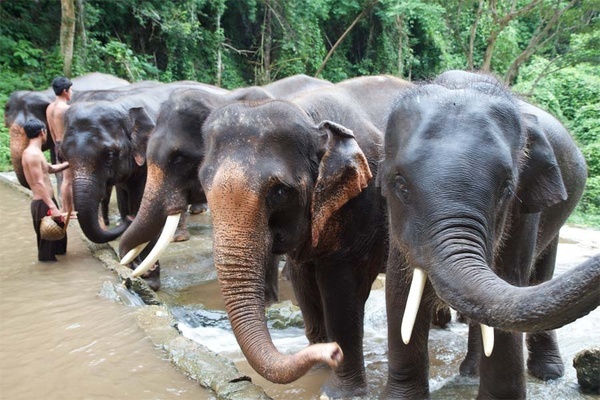 "You see," said a mahout, smiling, "Elephants are just like people." If only everyone treated them this way.